"This Aldi exclusive is taking more than one market by storm. The UK is going nuts over it and I should think will flog containers of the brand this coming Christmas and it's easy to understand why. Its quality to price ratio for Champagne is fantastic." "Ahh ALDI (not McCain's), you've done it again!! 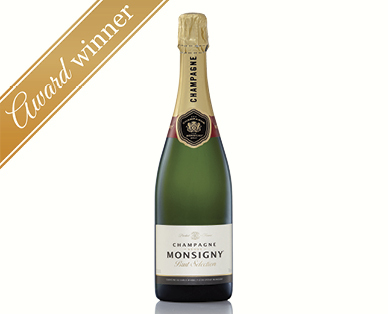 Recently whilst in Sydney, I popped into an ALDI supermarket and bought a bottle of CHAMPAGNE MONSIGNY - non vintage for $26.50 a bottle. That's roughly about half the price that the known brands sell for at the evil duopoly (Coles & Woollies) and cheaper than a good bottle of Shiraz!! This wine had lovely aromatics with plenty of yeasty autolysis and a sensational dynamic bead (bubbles) that launched an explosion of flavour into one's mouth. There was a hint of sweetness on the palate but it finished crisp and dry. The acidity in this Champagne was less searing than in most others, making it a smoother, more consumer-friendly wine. Normally I can only drink one to two glasses of Champagne before the acidity starts to upset my system, but with the Champagne Monsigny, the third glass went down just as well (or maybe even better) than the first two. What a sensational wine. Like I said: Ahh ALDI, you've done it again!!" "The Aldi wine team are wizards - their ability to spot high-quality wines at bargain prices is magical. This $25 Champagne is a case in point.................. It's bright, fresh and flavoursome. There are aromas of spiced apples, honeysuckle, white peach and almonds with refreshing flavours of the same ilk. Good length and persistency."